Kibale National Park is home to a vast number of species of birds as well as the greatest variety and concentration of primates found anywhere in East Africa; 13 remarkable primate species, including L’Hoests and red colobus monkeys flourish within the park. Add to this the the fact that the elusive forest elephant move seasonally through the forest and you can see why Kibale National Park is a superb safari destination. The park itself is easily accessible with a good internal infrastructure; many of the facilities are community based, thus providing the local population with the necessary revenue to ensure the long-term protection of the area. As the most accessible of Uganda’s major rainforests, Kibale is a home for over 13 remarkable primate species, including L’Hoest’s and red colobus monkey. The elusive forest elephant, smaller and hairier move seasonally into the developed part of the park. With a Size of: 795km2 situated In the west of Uganda near Fort Portal, Kibale is highest at the park’s northern tip, which stands 1,590m above sea level.The lowest point is 1,100m on the floor of the Albertine Rift Valley to the south. 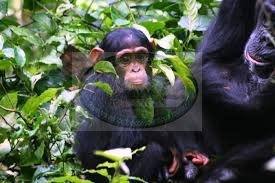 Kibale Tourism activities: Chimp tracking, Bird watching, forest walk and game viewing over an expanse of beautiful crater lakes lying between Fort Portal and Kibale Forest.